The use of mobile apps seems to dominate the Philippine mobile market today, and people are often mistaken that all apps are just the same like Video calls, Stickers, FREE SMS. You got it wrong. Do you really know about WeChat? 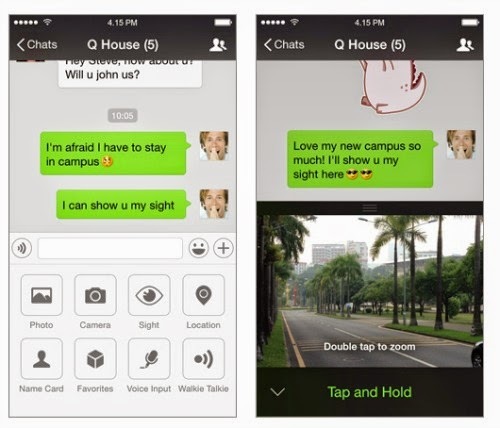 Here are the 10 things you don't know about WeChat. WeChat Private Group you can act like a Sherlock Holmes, a spy wherein you can invite and add your friends to chat using your 4 digit password before they can see your top secret. The password is the KEY to join the PRIVATE GROUP. By using the WeChat People Nearby, you will get the chance to meet your next BFF or even your partner in life. 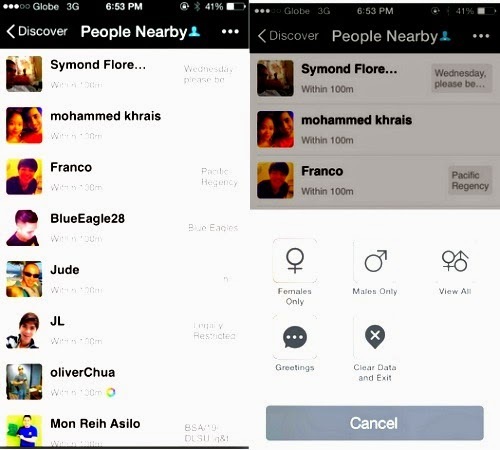 It has a TINDER like features that allows you to talk to people that are near your area. We never know, your prince charming or your lady is just around the corner and you know what that means! This is so nice because they have a moving stickers! Some apps use STATIC Stickers only. Now, that's more like it! 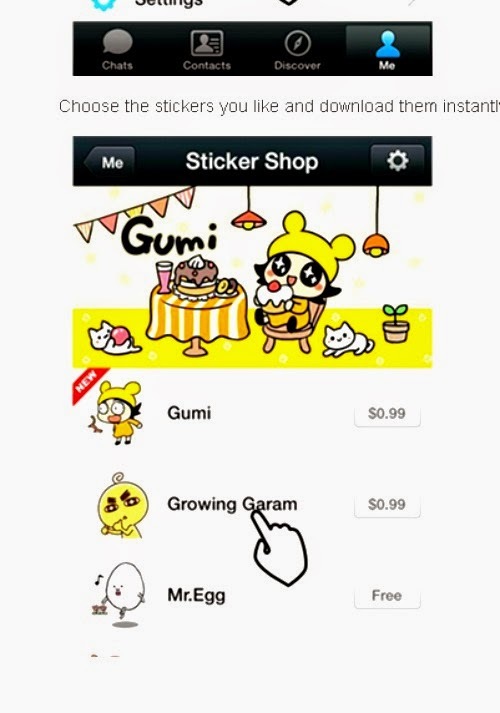 You can even make yourself a sticker of your own face and turn it to a moving stickers, then upload your own GIF by uploading it to WeChat and you will have your own set of stickers. Cool! Right? Add up to 100 People at WeChat Group Chats. 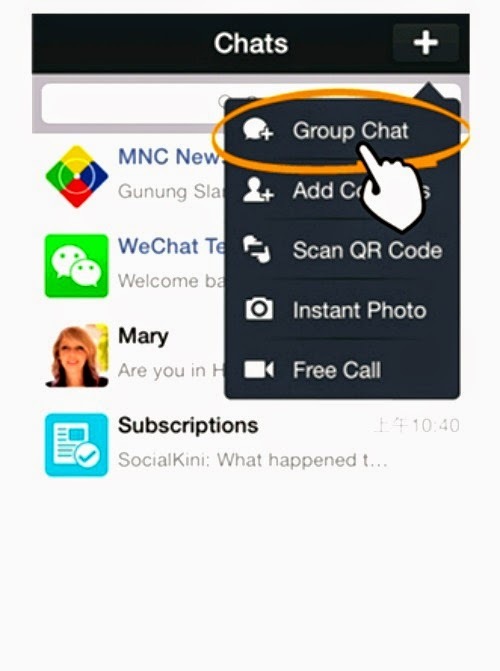 At WeChat you can add up to 100 people with your group chats. You can send PHOTOS, NAME CARD, use the WALKIE TALKIE Function, chat with each other and send personal stickers. Christmas is fast approaching, thinking of organizing an event, gimiks or reunion with your classmates/batch mates stay up to date by using WeChat Group Chats. Who loves FREE LOAD and CINEMA TICKETS? 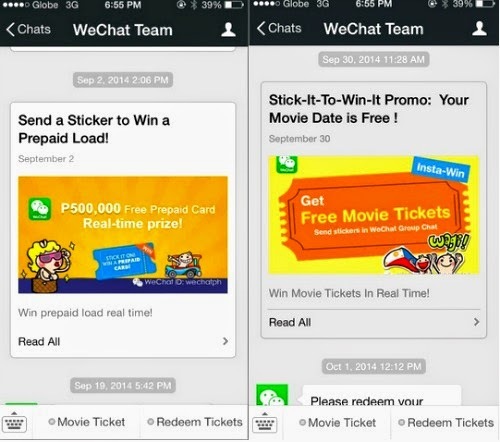 Last month WeChat launched their FREE LOAD worth PHp15 load to all WeChat PH Users. And just this October they gave away a total of 1,500 CINEMA TICKETS worth PHp200 each. And more FREEBIES to come! Yepeeh! First to launch "HOLD TO TALK". 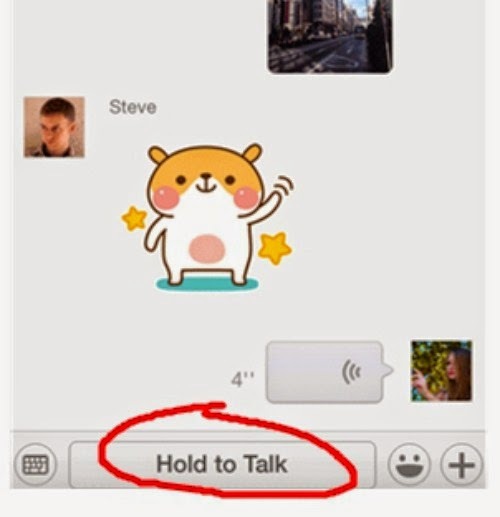 Before Whatsapp launch this kind of feature, WeChat already use this service for a long time in China. What is "HOLD TO TALK"? We know girls are fond of going to a salon and have their nails done and their nail polish still wet and need to call their boyfriend or friends to pick them up. Hold To Talk is the answer. Just push the button "HOLD TO TALK" and they will hear you immediately. WeChat is created by the world renowned Internet Giant, Tencent. Considered to be one of the TOP FIVE INTERNET COMPANIES FIRM in the world, next to FACEBOOK ang GOOGLE. A Combination of all Social Networking Sites and Chat Apps in the Market. 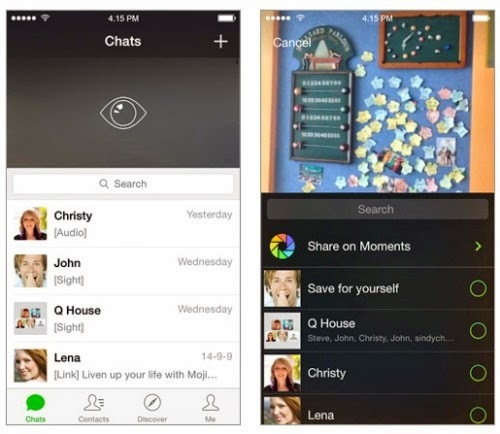 Messenger + Social Network + Social Media = WeChat. It has a Facebook like features(Moments & Official Account), TINDER(Friend Radar, Shake and People Nearby), SKYPE(High Resolution Video Calls, Whatsapp(Hold to Talk) to a name a few. Get the picture now? So, why download these all social networking sites/apps where you can have ONE to do all the job. Scan the QR code and you can now use the WeChat App in the comfort of your desktop. 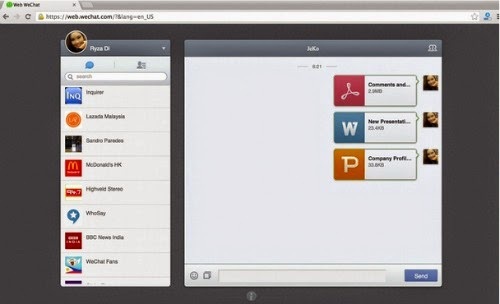 You can attach big files such as WORD, EXCEL and POWERPOINT. The new upgrade on their IOS (WeChat 6.0) you can now SHARE A SIGHT. CAPTURE A SIGHT quickly by sliding down the Chats screen. Make a QUICK 6-second video clip. 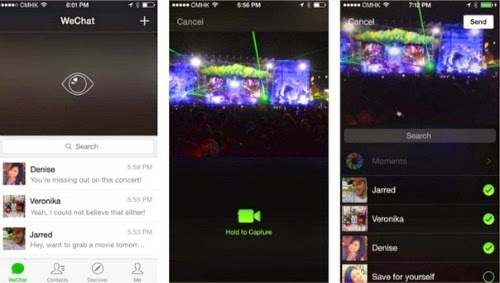 All of this features from WeChat IOS can automatically share through Moments or Chats. A great way to SHARE your experiences, activities and fun, that's so quick and entertaining! WeChat envisions and innovates new ways for people to connect, communicate and most of all to SHARE. It is the world's fastest growing mobile social communication app design, with hundreds of millions smartphone users internationally. So what are you waiting for? Try the newest way to communicate, share and win fabulous FREEBIES!